Blog How to Soundproof a Room For Under 50 Dollars That Actually Work! Have you been thinking of soundproofing a room in your new construction but don’t have the financial means to spend hundreds of extra dollars to do so? Why would you not give it a try because most of us when building a new house goes over budget by thousands, so every dollar counts in these final phases of construction? 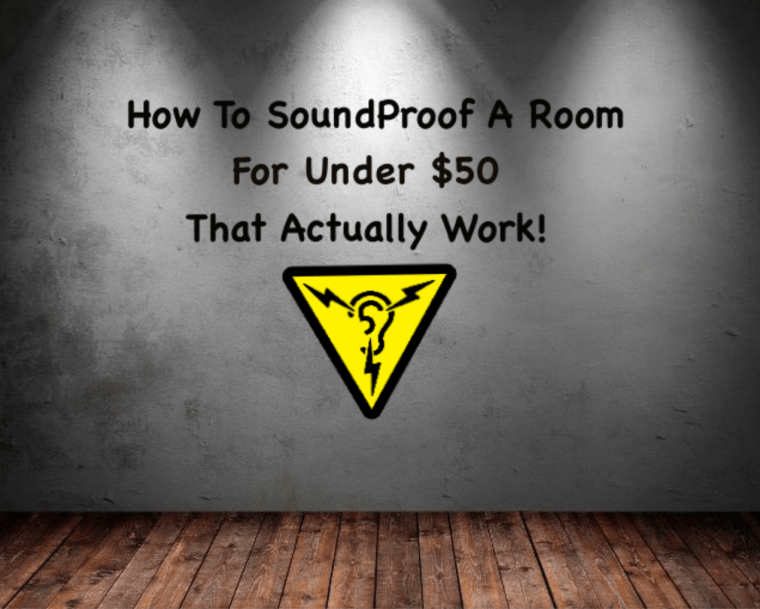 I have great tips on how to soundproof a room for under 50 dollars that actually work! And the best thing about this soundproofing tip is you don’t need a contractor to make it happen you can easily go the DIY route. So, of course, this method that im going to talk about will not do as good a job as what you would get if you spent a thousand dollars to soundproof a room in your house but it will certainly help. This phase is pre-drywall so if you already have. The drywall installed then this is not the article for you. BUT you can indeed click on our home button and check out our many other soundproofing articles to find exactly what you’re looking for. Lets now focus on when to spend your fifty dollars because with this little amount of money you want to go straight to the spots that will make the most significant difference. What I want you to do now is think about the room you want to soundproof or better yet, stand inside the room. The first wall you want to cancel from this soundproofing project is an exterior wall. The second wall you should forget about is the partition that contains the closet. Closets do a great job at sound deadening because of the air gap and also the clothing inside the closet absorbs a good amount of noise. Now you should have two walls left if the room you want to soundproof is similar to the type of room im referring to. The walls you want to focus on is the one that adjoins to a hallway and to another room like a washroom. Hallways are notoriously loud; And you can also imagine how loud and annoying a toilet flushing in the middle of the night can become. All you will need for this little project is one tool and two items that will cost you around 50 dollars! Hex Rod Cradle Caulking Gun; Caulking guns, also called caulk or cartridge guns, dispense a controlled flow of products such as caulk, sealants, and adhesives from a tube or cartridge. A manual caulking gun consists of a frame which holds the tube, a trigger, and a rod which moves forward when the trigger is depressed, dispensing the product. Manual caulking guns have a thrust ratio; the higher the thrust ratio, the easier it is to dispense the caulk, sealant, or adhesive. Click here for current Amazon price/Usually under ten bucks! SpecSeal Putty Pads; These pads feel double the thickness and weight of “Flame Tech pads.” The only downside is the texture is more like playdough, and when you open them by pulling off the plastic wrap, the putty pad tends to curl inward and stick to itself. All you need to do here is hang on to the corner when you open it, and you should be fine. I found it easier to work with than other pads of the same type; I found the SpecSeal putty pad more pliable than the cheaper competitor. Wear gloves while applying these pads, they are very sticky. They will hold long term, but I would still apply some acoustical caulking around this product just to be sure. Click here for more information on Amazon. Now that we have our products we can begin the process of soundproofing a room for under 50 dollars. So before you put the sheetrock up, you will want to focus on all the holes that will remain after the sheetrock is installed. Sheetrock itself does a great job at soundproofing, it is very dense and heavy and will do an adequate job at stopping some of the noise coming from the adjoining rooms. But remember all the holes that are left in the drywall. Anywhere there’s a hole in that drywall there will be a lot of noise travel through there because there’s air that can travel through there. All the electrical outlets are big holes in your drywall, so that’s where we are going to focus first. Before I continue, I wanted to address a concern I’ve heard previously from some people online. I’ve mentioned in my excellent article “How to soundproof a Basement Ceiling” about air being a perfect insulator. That is true, but we are talking about two different concepts when talking about noise reduction. The sound generated by striking a wall or floor is different then sound traveling first through the air and then hitting that same wall. Like I’ve previously mentioned, sound travels faster through solid objects, but the mass of an object is what dampens it when moving through the air. A tiny hole is essentially having zero mass between the noise and the person in the other room. Making something airtight then adding mass will soundproof. Our first step is to seal the holes and cracks that will be left after the drywall is installed. So before installing your drywall, get your SpecSeal acoustical putty pads because we are going to wrap them around your electrical outlets. Air gaps in electrical outlets. If you take a closer look at the electrical outlets, you will notice that there’s air that can travel through the holes where the electrical wires are going through. That’s where you will want to spend some time and energy by detailing those holes. 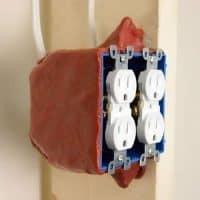 The putty pads are like play dough, they are very formable and moldable but take your time installing a pad on every outlet. First, focus on the knockouts where the electrical wires are going through by sealing those holes and adhering the putty with the wires onto the plastic box. You also need to seal any knockouts that are not in use. There are typically two on the bottom and two on the top. There might even be four on each end If you have a double outlet. Make sure they are entirely air sealed by using the acoustical putty pads. Sealing with Green Glue soundproofing sealant. Step two will be during the drywall installation phase. 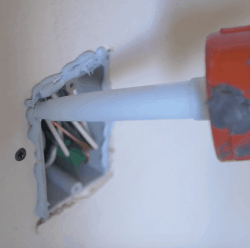 If you’re hanging the drywall yourself, here’s a small tip for you. By using the green glue noise-proofing sealant, position the sealant in between the sheets of drywall. When the two layers of drywall meet, they will automatically seal on each other. 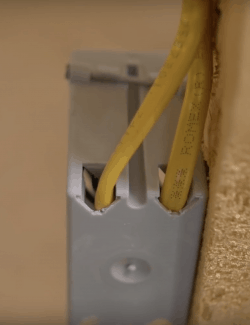 Air seal electrical outlets where the sheetrock meets the outlets. If you’re not the drywall contractor and you’re doing this process after the drywall is in place, you will not be able to seal in between the sheets. That’s not quite as important; the most important is to air seal the electrical outlets where the sheetrock meets the outlets. Lay the sealant on all four sides where the sheetrock meets the outlet. The acoustical sealant your using will probably be enough to do an entire room if you have around five or six outlets. One tube will cost approximately twenty-five dollars. Don’t skimp out on the right sealant and use regular painters caulking. 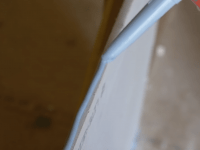 Regular painters caulking will not work well in the long term because it will harden and crack over time while a soundproofing sealant is going to remain flexible for the lifetime of the product. Applying soundproofing sealant between the drywall and the floor. Another tip for you if the drywall is already in place, apply sealant between the drywall and the floor. Lay the green glue sealant right at the joint where the drywall meets the wooden subfloor. That will help soundproof that bottom plate area. I know what you’re thinking, this will probably not soundproof a room well. 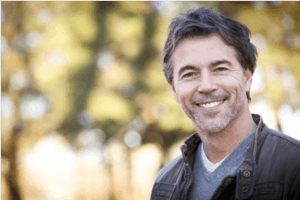 All I can say is that if you only have around fifty dollars to spend soundproofing a room, these are the most important things to do to have the best results possible. You would be surprised as to how much noise reduction there will be by simply sealing cracks and filling holes. I hope you learned something today and please leave a comment in the comment section below if you know how to soundproof a room for under 50 dollars and what are the results of your soundproofing project. If you have more money to spend on soundproofing, check out my other articles on how to soundproof withing your budget.